On 13 January 2007, less than two months after the great earthquake of 15 November 2006, another great earthquake occurred off the east coast of the Kuril Islands. In spite of the quake's large magnitude, only a relatively small tsunami was generated. A tsunami warning was issued in Japan and for a large region of the Western Pacific. A watch was issued for Hawaii, Alaska and the Northwest Pacific. Only a small tsunami was recorded or observed in Hokkaido, Japan, and at distant locations in the Pacific. Magnitude - A Moment magnitude of 8.3 and a Richter magnitude of 8.1 were initially assigned to this event by the Pacific Tsunami Warning Center. Focal Depth - 10 km (6.2 miles). Aftershocks - There were many aftershocks after the main quake. Aftershock Distribution of the 13 January 2007 Earthquake (USGS graphic). The Kuril volcanic arc of 56 islands separates the Sea of Okhotsk from the Pacific Ocean. It extends for 1300km (700mile) from the northern Japanese island of Hokkaido, Japan to Russia's Kamchatka Peninsula. Earthquake Focal Mechanism - The focal mechanism of this earthquake was moderately well controlled and corresponded to normal faulting. Seismicity of the Northern Japan/Kuril island Region - The Kuril islands and Japan is a region of high seismic activity and accounts for about 20 per cent of the world's earthquakes. There was significant seismic activity in the region since September 2006, which culminated with a great earthquake in November 15, 2006. Several large earthquakes occurred also in December 2006. The 13 January event was the second great earthquake in less than two months. There have been several earthquakes with magnitude 8.0 or greater prior to the 17 January 2007 event. Great earthquakes occurred in 1952 (near Kamchatka), 1963, 1994, and 2003 and in November 15, 2006. The overall tectonics of northeast Asia is complicated. Whether the Sea of Okhotsk and the northern Japanese islands are part of the North American plate or of a separate Okhotsk microplate that is part of Eurasia has not been determined. On the Pacific Ocean side, earthquake slip vectors along the Kuril and Japan trenches are consistent with either a Pacific-North America or a Pacific-Okhotsk plate motion. We will assume that the Pacific-North America plate motion is better supported and that the Okhotsk microplate is part of North America block. The Kuril island arc is located between the Kamchatka Peninsula and the Japanese island of Hokkaido. The Kuril Trench has been formed by subduction of the Pacific plate under the North American plate. It extends from the offshore central area of Kamchatka to Hokkaido. The tectonics of the Southern Kuril Islands-Northern Hokkaido region are very different than those along the southern portion of the Japanese Trench. The South Kuril Islands are part of the Kuril arc in the Okhotsk plate which has been colliding westward against the Northeast Japan arc, along the Hidaka Collision Zone (HCZ), where new continental crust is created by active arc-arc collision. Postulated Delamination-wedge-subduction - Deep seismic reflection studies (Ito, Kazuka @Abe, 2001) show the lower crust of the Kuril arc to be delaminated at a depth of about 23 km. As stated, studies indicate that the upper half (above 23 km) - consisting of the earth's upper crust and the upper portion of lower crust of the Kuril arc - is thrusting over the Northeast Japan arc along the Hidaka Main Thrust (HMT) (Ito, Kazuka @Abe, 2001). However, the lower half (below 23 km) - consisting of the lower portion of lower crust and upper mantle material - is descending downward. Such delamination and horizontal displacement - as it will be discussed further - may account for the small tsunamis associated with both the 13 January 2007 and the 15 November 2006 earthquakes. As a result of such kinematic processes, the wedge of the Northeast Japan arc is intruded into the delaminated Kuril arc, as the Pacific plate is subducting northward beneath both of the above mentioned structures, thus continuing the arc-arc collision (and continental crust production). The complex, seismo-tectonic kinematic process of this region has been named "Delamination-wedge-subduction system" - which may apply also to other areas where active arc-arc collision and concurrent subduction take place. Accordingly, Hokkaido - Japan's northernmost island - extends northeast into Kuril Islands and is composed of multiple compressed island arcs. The northern half of Honshu (north of Tokyo), which is Japan's main island, represents a typical mature island arc, while the southern half of the island represents also a typical mature island arc, as the Philippine Sea plate subducts below the Eurasian plate. The Postulated Amurian Microplate - On the western side, the Sea of Japan/East Sea is a complex basin between Japan and the Korea/Okhotsk Sea Basin. It represents another subplate with apparent rotational movement as it interacts against the Okhotsk microplate, along the inland sea boundary of the Hidaka Collision Zone (HCZ). Based on recent studies of seismicity and earthquake focal mechanisms (Wei and Seno, 1998) a postulated Amurian microplate (AM) has been discriminated from the Eurasian plate (EU), which includes part of North China, Mongolia and Siberia and includes the Sea of Japan/East Sea. The postulated microplate is presumably in contact with the Eurasian plate (EU), the Okhotsk microplate (OK) and the Phillipine Sea plate (PH). This Amurian microplate appears to rotate in a counterclockwise direction, while the Okhotsk microplate appears to rotate in a clockwise direction. Movement and rotation along the eastern boundary of this postulated Amurian microplate along the Sea of Japan/East Sea appears to have been the region where two large tsunamigenic earthquakes occurred recently (in 1983 and in 1993). 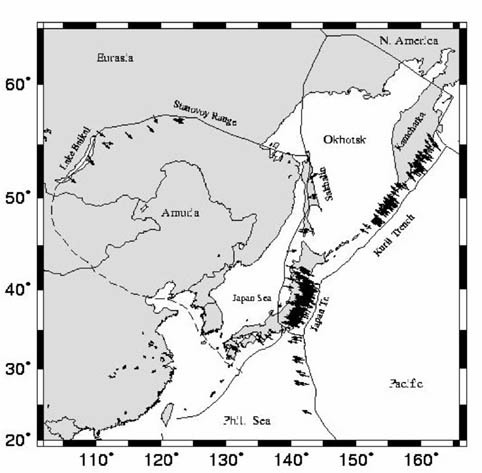 Sakhalin Island, north of Hokkaido, which separates the Sea of Japan from the Sea of Okhotsk, is probably the result of transpressional tectonics along the North America-Eurasia (Okhotsk microplate) boundary. A relatively small tsunami was generated by the great earthquake of 13 January 2007, which was recorded in the immediate region and at distant locations in the Pacific. Hanasaki - At Hanasaki (Hokkaido, Japan), at 0605Z the tide gauge registered a 10cm Japan 0.1m/0.3ft amplitude wave with period of about 28 minutes. Nemuro - A small tsunami wave of about 40cm (16 inches) was recorded at 9:29 p.m. at the port of Nemuro on Japan's northernmost island of Hokkaido. The Japanese Meteorological Organization issued a tsunami warning for Japan. The Pacific Tsunami Warning Center issued a tsunami warning for a broad area in the Western Pacific Ocean. The Alaska Tsunami Warning System issued a Tsunami Warning for the Alaska coastal areas from Sand Point, Alaska to Attu, Alaska. A Tsunami Watch was issued for British Columbia and Alaska coastal areas from the north tip of Vancouver I., British Columbia to Sand Point, Alaska. Advisories were issued only for California, Oregon, Washington, and the British Columbia. Based on earthquake aftershock distribution of the first 24 hours, a tentative estimate of the tsunami generating area can be obtained. The earthquake involved a block of about 80x 150 nautical miles. The last great earthquake in the near the Kuril Islands region had occurred on Wednesday, November 15, 2006 at 11:14:16 (UTC) (See http://drgeorgepc.com/Tsunami2006Kurils.html). That earthquake had an epicenter at 46.616°N, 153.224°E at about 100 nautical miles to the southwest of the 13 January 2007 earthquake. It was a deeper earthquake with hypocenter focal depth of about 40km/25miles and it was followed by a number of large aftershocks, some of which exceeded magnitude 6+. Tsunami watches and warnings were issued for a large section of the Pacific basin, however only a small tsunami of about 30cm/1.0ft. was recorded at Hanasaki, and 25cm/0.8ft at Hushiro, Japan At tide stations at Shemya and at Amchitka, Alaska the tsunami waves of amplitude 20cm/0.65ft and 8cm/0.25ft were recorded, respectively. However, the region remained seismically active. Following the 15 November 2006 great earthquake several smaller events occurred in the region during November and December 2006 and in January 2007. On Thursday, 7 December 2006 (19:10:21, UTC) a shallow (16 km focal depth) earthquake (magnitude 6.3) occurred at 46.16N 154.38E. This could have been a large aftershock of the 15 November 2006 earthquake or an independent event. On Tuesday. 26 December 2006, (15:19:46.000 UTC) a shallow focus (depth 6 miles (10 km)) earthquake (Magnitude: 5.60 Mb) occurred at 48.4630 N., 154.6940 and it appears to be a precursor event of the 12 January 2007 great earthquake and approximately 120 nautical miles to the north. October 13, 1963 - Kuril Islands (MS=8.1, I=2.5) - Urup tsunami. June 16, 1964 - Sea of Japan - (MS=7.5) - Niigata tsunami (26 dead). 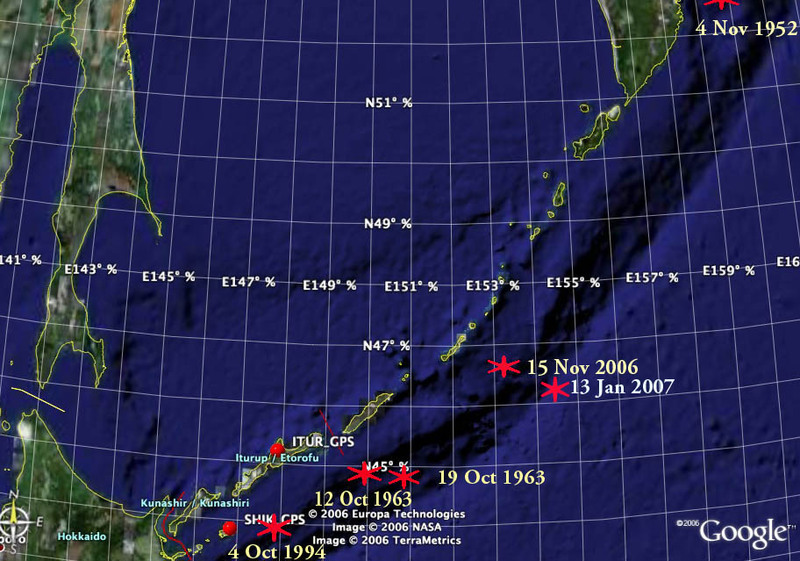 August 11, 1969 - Kuril Islands (MS=7.8, I=2.0) - Shikotan tsunamis. November 22, 1969 - Kamchatka (MS=7.7, I =3.0) - Ozernoy tsunami. May 25, 1983 - Northern part of Sea of Japan (MS= 7.7) - (104 dead). January 15, 1993 - Japan / Hokkaido (MS=7.8) - Kushiro tsunami, one dead. July 12, 1993 - Japan Sea (MS=7.7, I=3.0) - Okushiri tsunami (Maximum Wave Height 30.2m) (more than 200 dead). October 4, 1994 - South Kuril Islands/Northern Japan Hokkaido (MS=8.1, I=2.6) - Shikotan tsunami (8 dead in Kuril Islands). Dynamics of Pacific and North American (Okhotsk subplate) Tectonic Plate Interactions along the Central and Southern Kuril Trench. Possible Mechanisms Controlling Tsunami Generation. It would have been expected that the great earthquake of 13 January 2007 (Mw 8.2) - as well as the great earthquake (Mw 8.3) of November 15, 2006 would have generated much greater, Pacific-wide tsunamis. Neither one did. The reason is that the geometry of subduction and tectonic interactions along volcanic arcs are different than those of other tectonic collision boundaries - thus unique in tsunami generation for this particular region. The Pacific plate subduction along the southern Kuril Trench results in mega continental tension gashes that are parallel to the direction of convergence (Gelabert et al. 2001). Also the tension along convergent boundaries results in steep dipping faults that may be normal, strike-slip or thrust faults. To understand the dynamics of tsunami generation by large earthquakes in this region, we must look at the geometry of subduction processes and the mechanics of arc collision that create volcanic arcs such as the Kuril Islands and extensional back-arc basins - such as the Sea of Okhotsk. Subduction and Arc-Arc Collision - Subduction along the Japan and Kuril Trenches has been primarily responsible for many large historical earthquakes and catastrophic tsunamis on the Pacific side of Northern Japan and the South and Central Kuril island region (see section above about the tectonic setting). Most of the tsunamis had destructive near-field effects but limited far-field impact. The only recent exception may be the 1952 Kamtchatka earthquake - which occurred much further north - and generated a tsunami with significant Pacific-wide, impact. The geometry of subduction appears to be different along the Kamtchatka peninsula than in the Central and South Kuril Island region. High Rate of Subduction in the Hokkaido/Kuril Island Region - The Pacific plate converges into northeastern Asia (the Okhotsk subplate which is believed to be part of the North American plate, separated from the Eurasian plate (along the postulated Amurian microplate?) by the Hidaka Collision Zone (HCZ)). The rate of tectonic convergence along the Kamchatka, Kuril and Japan trenches is estimated at about 8-9 m per century - which is a very high. Hokkaido, which extends northeast into the Kuril Islands, is composed of multiple compressed island arcs. In the past two centuries, this fast rate of subduction has triggered several large earthquakes with magnitudes of up to 8 or more along the southern Kuril trench, near the island of Hokkaido. However, these historical earthquakes have ruptured segments of the trench and of the fore arc region that have been only in the range of 100-200 km long. Thus, these must be considered as characteristic of most plate-boundary recent earthquakes for this volcanic arc region - although, there is geologic evidence that great earthquakes with multi-segment ruptures have occurred also in the past which have resulted in extremely large tsunamis. However, earthquakes with multi-segment ruptures are infrequent and none is known to have occurred within recorded history. Ground Movements and Effects of Rotation - Apparently, the grinding motion of the North Pacific Plate against this Okhotsk microplate, results in large earthquakes - such as those of 1963 and 1994 - but apparently with less vertical subduction and more rotational movement. 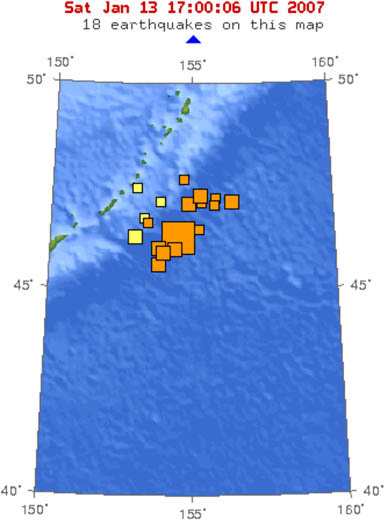 For example, the 1994 quake resulted in only about 50 cm of land subsidence but in extensive lateral movement at Shikotan Island. A greater amount of subsidence would have been expected, given the earthquake's large magnitude. Also, the October 4, 1994 earthquake generated a destructive local tsunami with runup height of up to 10 meters in the South Kuril Islands but the far field effects were not significant. Maximum runup along the coast of Hokkaido, Japan, was 1.8 meters (at Nemuro). Maximum runup in the Hawaiian islands was 0.8 meters (at Kahului, Maui). Crustal Displacements and Rupture Length Effects - Tsunamis are generated by relatively shallow crust disturbances associated with large earthquakes and long ruptures. The extent of crustal displacements and the length of earthquake ruptures - as inferred from the distribution of aftershocks - are major factors in the tsunami generation mechanism and on whether there will be significant far field tsunami impact. The crustal area in the Southern Kuril Islands and Northern Hokkaido, along the northern part of the Japan and Kuril Trenches, appears to be highly fractured. As described previously, the South Kuril Islands are part of the Kuril arc in the Okhotsk microplate which has been also colliding westward against the Northeast Japan arc, along the Hidaka Collision Zone (HCZ), where new continental crust is created by active arc-arc collision. Crustal displacements appear to be occurring along these boundaries of highly fractured subplates that may not be longer than 200-300 km and probably much less. It appears that these fractured smaller plates - truncated by oblique asperities - limit the length of ruptures and extent of crustal displacements, and therefore, the amount of energy imparted for tsunami generation. Multi-segment ruptures - The majority of earthquakes in the central and southern Kuril islands and the Hokkaido region - even those of large magnitude - usually involve single segment ruptures along the Kuril trench - segments truncated by oblique asperities. Such earthquakes with relatively short single segment ruptures do not generate very large Pacific-wide tsunamis. Most of the destructive effects of the tsunamis are local in the Kuril Islands and northern Hokkaido region. Recent historical earthquakes in the region have been associated with single segment ruptures. The Kuril Island Earthquakes of 13 October 1963 (Ms = 8.1; Mw = 8.5) the 19 October 1963 (Ms = 7.2; Mw = 7.8) and the October 4, 1994, were such single segment events. They did generate destructive local tsunamis but the far field effects were not significant. However, what may be significant is that these two major earthquakes occurred a week apart in the same region. Also, that the second earthquake on 19 October 1963 occurred somewhat east of the 13 October 1963 event. 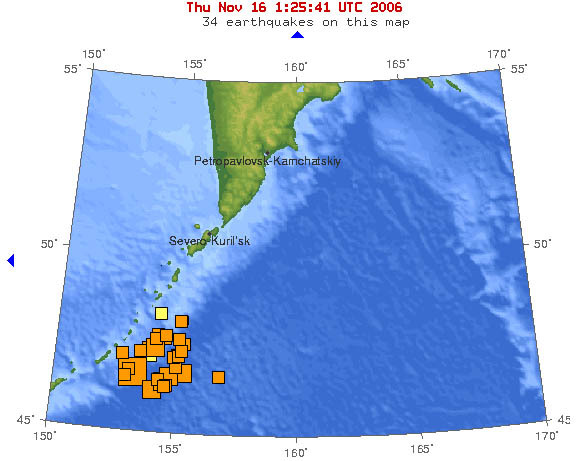 The January 13, 2007 earthquake - like those of November 15, 2006, of 1994 and of 1963 - occurred on the Pacific side boundary of the smaller tectonic subplate which includes the Sea of Okhotsk and possibly a portion of the northern part of the Sea of Japan / East Sea (Pararas-Carayannis, 1995). It appears that the pair of earthquakes of November 15, 2006 and January 13, 2007, which occurred in less than two months in the same general region, was similar to the pair of events that occurred in 1963. The January 13, 2007 event occurred somewhat east of the previous event. One possible explanation for the occurrence of great earthquakes in the same region within the short time frame may be crustal delamination processes and the mechanics of volcanic arc collision that create extensional back-arc basins (such as the Sea of Okhotsk). Crustal Delamination, Transpressional Effects and Back Arc Migration - If crustal delamination occurs below 23 km as postulated (Ito, Kazuka @Abe, 2001) such process would also account for the smaller tsunami as there is less vertical movement of crustal material below 23 km and more lateral movement above. As it was pointed out, the 1994 earthquake resulted in only about 50 cm of land subsidence but extensive lateral movement at Shikotan Island. The earthquake of November 15, 2006 had a focal depth of 28.5 km. Given the short rupture of the earthquake and the focal depth below the delamination boundary of 23 km this would explain why no major tsunami was generated that had significant far field effects. Most of the earthquake's energy went into lateral transpressional movement along this boundary of subduction - filling the void caused by Kuril arc migration by pushing the subducting (and denser) plate horizontally towards the extensional basin (Sea of Okhotsk) - as in 1994. Such migration would also account for the close sequence of a pair of the great earthquakes, the first occurring on November 15, 2006 and the second occurring in January 13, 2007- slightly to the east and shallower. Can the Kuril Island/Hokkaido region generate tsunamis that can have significant far field destructive effects (Pacific-wide)? Based on the stratigraphic distribution of deposits of historical tsunamis found in Japan, it has been inferred that unusually large tsunamis have occurred in this region. The significant runup of these tsunamis leads to the conclusion that they were generated by earthquakes which ruptured two or more segments along the Japan Trench or along the central and southern Kuril Trench. Such events are extremely rare but may occur every 500 years or more and could have significant regional and far field impact. The following are selected references for further reading on the kinematics of tectonic interactions along the Japanese and Kuril Island arcs which historically have produced numerous destructive tsunamis. Iida, K., D. C. Cox, and G. Pararas-Carayannis (1967). Preliminary catalog of tsunamis occurring in the Pacific Ocean, Hawaii Institute of Geophysics Report 67-10, Univ. of Hawaii, 274pp.1962. Nakamura, K., V. Renard, J. Angelier, J. Azema, J. Bourgois, C. Deplus, K. Fujioka, Y. Hamano, P. Huchon, H. Kinoshita, P. Labaume, Y. Ogawa, T. Seno, A. Takeuchi, M. Tanahashi, A. Uchiyama, and J. L. Vigneresse. Oblique and near collision subduction, Sagami and Suruga troughs -Preliminary results of French-Japanese 1984 KAIKO cruise, leg 2 Earth Planet. Sci. Lett. 83 229-242 1987. Tanioka, Y., and K. Satake (1996). Fault parameters of the 1896 Sanriku tsunami earthquake estimated from tsunami numerical modeling, Geophys. Res. Letters, 23-13,1549-1552. Aver£yanova V. N. (1975). Depth seismotectonics of island arcs. Moscow, 1975, in Russian. Belyaevsky N. A., Rodnikov A. G. (1972). Crustal structure of the island arcs and Far Eastern Seas. Article 1. Island Arcs. International Geology Review, v. 14, No. 2, 1972. Bikenina S. K., Anosov G. I., Argentov V. V. and Sergeev K. F. (1987). The Earth crust structure of the southern part of Okhotsk Sea according to seismic data. Nauka, Moscow, 1987, 87 pp., in Russian. Bogdanov N. A. (1988). Deep basin tectonics of margin seas. Nedra, Moscow, 1988, 221 pp., in Russian. Boldyrev S. A., Gainanov A. G. and Stroev P. A. (1993). Density inhomogeneities of the lithosphere and dynamics of the North-West Pacific active belt. In: Marine Gravity Investigations (P.A.Stroev, ed.). National Geophysical Committee, Moscow, 1993, 106-119, in Russian with English abstract. Burmin V. Yu., Savrina L. A. and Kugaenko Yu. V. (1992). Velocity section of the upper mantle of the Okhotsk Sea region with using deep foci earthquakes data. Volcanology and Seismology, No. 2, 1992, 64-75, in Russian. Eds. S. M. Zverev and Y. V. Tulina. Nauka, Moscow, 1971, 286 pp., in Russian. Fedotov S. A., Chernyshev S. D., Chernysheva G. V. and Vikulin A. V. Determination of the boundaries of earthquakes sources with M>=7 3/4, peculiarities of seismic cycle and long-term seismic prediction for the Kurile-Kamchatka arc. Volcanology and Seismology, No. 6, 1980, 52-67, In Russian. Frolova T. I., Perchuk L. L. and Burikova I. A. Magmatism and transformation of the Earth crust of the active margins. Nauka, Moscow, 1989, 261 pp., in Russian. Geology-geophysical atlas of the Kuril-Kamchatka island system. Deep structure of the North-East Japan Arc and its relationship to seismic and volcanic activity. Eds. K.F.Sergeev and M.L.Krasny. Institute of Marine Geology and Geophysics, 1987, 40 pp. Hilde T. W. C., Uyeda S. and Kroenke L. Evolution of the Western Pacific and its Margin. Tectonophysics, v. 38, No. 1/2, 1977, 145-165. Honza, E., and K. Tamaki, The Bonin Arc, in The Ocean Basins and Margins, edited by A. E. M. Nairn et al., Vol. 7, pp. 459-502, Plenum Co., New York, 1985. Isezaki N., Yosui M. and Uyeda S. Possible spreading centers in the Japan Sea. In: Geological-geophysical researches of the transition zone from the Asiatic continent to the Pacific Ocean. Sov. radio, Moscow, 1976, 72-80. Jolivet, L., and K. Tamaki, Neogene kinematics in the Japan Sea region and volcanic activity of the NE-Japan arc, in Proc. ODP, Sci. Results, edited by Tamaki, K., Suyehiro, K., Allan, J., McWilliams, M., et al., Vol. 127/128, Pt.2, pp. 1311-1331, College Station, TX (Ocean Drilling TAMU), 1992. Jolivet, L., K. Tamaki, and M. Fournier, Japan Sea, opening history and mechanism: a synthesis, J. Geophys. Res., 99, 22237-22259, 1994. Khain V. E., Lomize M. G. Geotectonics with elements of geodynamics. Moscow State University, 1995, 480 pp, in Russian. Kimura, G., and K. Tamaki, Tectonic framework of the Kuril Arc since its initiation, in Formation of Active Ocean Margins, edited by N. Nasu et al., pp. 641-676, Terrapub., Tokyo, 1985. Kimura, G., and K. Tamaki, Collision, rotation, and back-arc spreading: the case of the Okhotsk and Japan Seas, Tectonics, 5, 389-401, 1986. Kobayashi, K., M. Nakanishi, K. Tamaki, and Y. Ogawa, Outer slope faulting associated with the western Kuril and Japan trenches, Geophys. J. Int., 134, 356-372, 1998. Krasny M. L. Geophysical fields and deep structure of the Okhotsk-Kuril region. Dalnevost. Otdel. Akad. Nauk USSR, Vladivostok, 1990, 161 pp., in Russian. Lyapishev A. M., Sychev P. M. and Semenov V. Yu. Structure of electroconductivity of the upper mantle of Kuril Basin of Okhotsk Sea. Tihookeanskaya Geologia, No. 4, 1987, 45-50, in Russian. Oscorbin L. S. Sakhalin seismicity. In: Seismic Zoning of Sakhalin (S.L.Solov'ev, ed.). SakhKNII, Vladivostok, 1977, in Russian. Pisciotto, K., K. Tamaki et al., Exploring the Japan Sea, Geotimes, 1989. Rodnikov A. G. About tectonics of Iturup Island. Vestnik MGU, Geology, No. 6, 1968, 92-94, in Russian. Rodnikov A. G. Island arcs of the western part of the Pacific Ocean. Nauka, Moscow, 1979, 152 pp., in Russian. Rodnikov A. G., Khain V. E. On the trend in evolution of the Earth's crust in the north-western part of the Pacific mobile belt. In: Island Arcs and Marginal Sea (S.Asano and G.Udintsev, eds.). Tokai University Press, 1971, 65-76, in Japanese. Rodnikov A. G., Rodnikova R. D. The Japan - Sakhalin Island Arc. Nauka, Moscow, 1974, 74 pp., in Russian. Rodnikov A. G., Rodkin M. V., Ermakov B. V. et al. The Okhotsk Sea Geotraverse. 27th General Assembly IASPEI, Wellington, NZ., 1994, S8.51. Rogozhin E. A. Focal mechanism of the Neftegorsk (Sakhalin) earthquake of May 27(28), 1995. Geotectonics, No. 2, 1996, 45-53, in Russian. Semenov R. M., Pavlenov V. A. and Charahinov V. V. Catastrophic earthquake at the north Sakhalin (short seismogeological characteristic). Dokl. Akad. Nauk SSSR, v. 351, No. 4, 1996, 535-538, in Russian. Semenova G. I., Zorina Yu. G., Kunin N. Ya. and Rodnikov A. G. Upper mantle zoning of the Pacific with using geophysical investigation data. In: Structure and Dynamic of Transition Zones from Continent to Ocean. (V.V.Belousov, M.E.Artem'ev and A.G.Rodnikov, eds.). Nauka, Moscow, 1986, 57-65, in Russian. Sergeev K. F. Tectonics of Kuril island system. Nauka, Moscow, 1976, 239 pp., in Russian. Snegovskoi S. S. Reflection method investigations and tectonics of the southern part of Okhotsk Sea and adjacent frontier area of the Pacific. Nauka, Novosibirsk, 1974, 86 pp., in Russian. Soloviev S. L., Oscorbin L. S. and Ferchev M. D. Earthquakes at Sakhalin. Nauka, Moscow, 1967, 178 pp., in Russian. Structure of the Okhotsk Sea floor. Ed. V. V. Beloussov, Nauka, Moscow, 1981, 176 pp., in Russian. Structure of the floor of the north-western Pacific. Eds. Yu. M. Pushcharovsky and Yu. P. Neprochnov. Nauka, Moscow, 1984, 231 pp., in Russian. Structure and dynamics of the lithosphere and asthenosphere of the Okhotsk Sea region. Eds. A. G. Rodnikov, I. K. Tuezov and V. V. Charahinov. National Geophysical Committee, Nauka, Moscow, 1996, 340 pp., in Russian. Sychev P. M. Deep and surface tectonics processes of the north-western Pacific mobil belt. Nauka, Moscow, 1979, 208 pp., in Russian. Tamaki, K., Two modes of back-arc spreading, Geology, 13, 475-478, 1985. Tamaki, K., and E. Honza, Incipient subduction and obduction along the eastern margin of the Japan Sea, Tectonophys., 119, 381-406, 1985. Tamaki, K., Geological structure of the Japan Sea and its tectonic implications, Bull. Geol. Surv. Japan, 39, 269-365, 1988. Tamaki, K., and E. Honza, Global tectonics and formation of marginal basins: a role of the western Pacific, Episodes, 14, 224-230, 1991. Tamaki, K., Opening tectonics of the Japan Sea, in Backarc Basins: Tectonics and Magmatism, edited by B. Taylor, pp. 407-420, Plenum Press, New York, 1995. Tamaki, K., and I. I. Bersenev, Morphology of the Japan Sea, in Gelogy and Geophysics of the Japan Sea (Japan-USSR Monograph Series, Vol 1), edited by N. Isezaki, I. I. Bersenev, K. Tamaki, B. Ya. Karp, and E. P. Lelikov, pp. 35-39, Terra Scientific Publishing Company (Terrapub), 1996. Tamaki, K., and N. Isezaki, Tectonic synthesis of the Japan Sea based on the collaboration of the Japan-USSR Monograph Project, in Gelogy and Geophysics of the Japan Sea (Japan-USSR Monograph Series, Vol 1), edited by N. Isezaki, I. I. Bersenev, K. Tamaki, B. Ya. Karp, and E. P. Lelikov, pp. 483-487, Terra Scientific Publishing Company (Terrapub), 1996. Tarakanov R. Z. Structure of the focal zone of the Kuril-Kamchatka island arc. In: The Earth Crust of the Island Arc and Far East Seas (N. A. Beliaevsky, A. G. Gainanov and A. G. Rodnikov, eds. ), Nauka, Moscow, 1972, 215-234, in Russian. Tectonics of the north-western Pacific Ocean. Ed. A. G. Rodnikov. Nauka, Moscow, 1983, 120 pp., in Russian. Tuezov I. K. The lithosphere of transition zone from Asia to Pacific. Nauka, Novosibirsk, 1975, 232 pp., in Russian. Vasilenko N. F., Bogdanova E. D. Horizontal movements of the Earth surface in zone of the central Sakhalin deep fault. Pacific Geology, No. 3, 1986, 45-49, in Russian. Vasiliev B. I. The main features of the geological structure of North-West part of Pacific. Vladivostok, 1988, 192 pp., in Russian. Zlobin T. K. Lithosphere sructure in the region of the Iturup Island from seismic data. Pacific Geology, No. 3, 1989, 33-41, in Russian. Zlobin T. K., Zlobina L. M. The Earth crust structure of the Kuril Island system. Pacific Geology, No. 6, 1991, 24-35, in Russian.